It wasn’t so long ago that the Germans adored the Greeks. Cast your mind back to 2004 and the European football championship. It was a fairy tale football finale for Greece, cheered on whole heartedly by Germans, who though a tad shocked after their national side was knocked out, were elated that Greece was guided to a glorious 1-0 victory by German manager Otto Rehhagel. But oh meine Damen und Herren, what a difference an EU financial crisis makes. Especially when your average German is trying to work out if Berlin should be bailing out Athens to the tune of about 8 billion euros and where exactly do their politicians stand on the issue. A TV talk show debate on the proposed Greek bailout mid-week had me rather engrossed (which is saying something as I feel there’re far too many talk shows on the national broadcaster). Politicians from across the spectrum thrashed out their views on how to help Greece on the appropriately named programme, Hard But Fair. 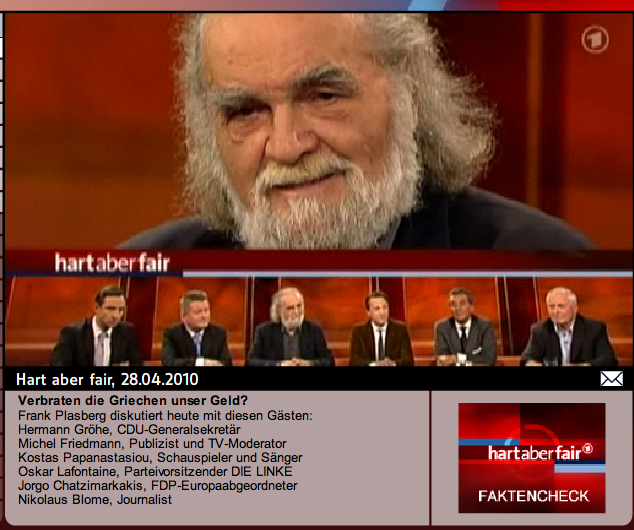 Though a well known Greek-Berliner restaurateur-actor on the panel somewhat struggled to get a word in. "Greeks want even more billions from us!" Regular Bild readers might have been dismayed that such a headline left hardly any room for the page 1 girl. The tabloid spelt out rather simply that while the coalition government considers billions of euros for helping Greece, there’s no money for tax cuts, repairing schools or maintaining streets and parks. Meanwhile, we have to keep things stable. 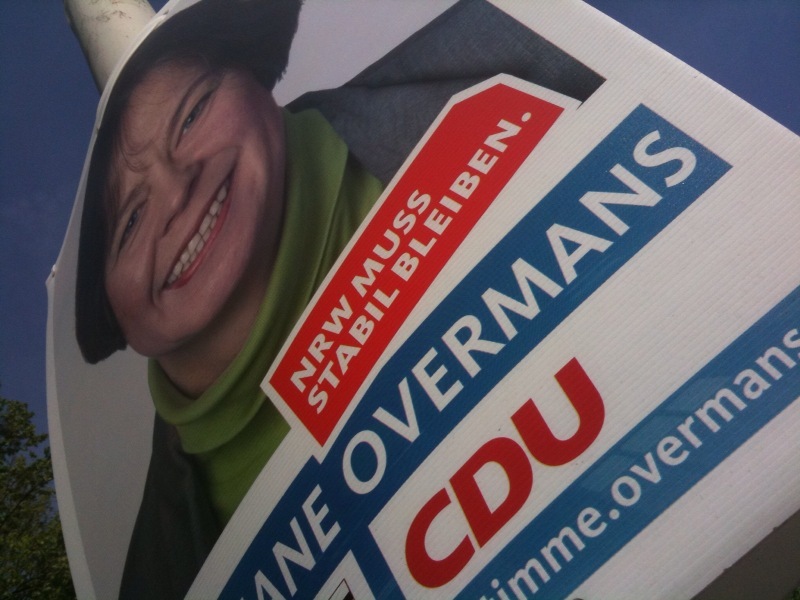 That’s what Chancellor Merkel’s CDU party is campaigning for in the May 9 election in Germany’s largest state, North Rhine Westfalia (NRW). A state election which might end up signaling what Germans think about the federal government stepping in to help sort out the economic woes of Greece. The emergency Eurozone summit is scheduled the day after the NRW elections. However while Germany, being the good EU member that it is will be seeking to do its (usual) part to maintain stability in the Eurozone, the German reaction to whole episode has me thinking back to what Timothy Garton Ash mentioned at a Frontline Club talk recently. TGA spoke about Germany’s change in attitude towards Europe. Germany is now much more sceptical and much more happier talking about national interests.